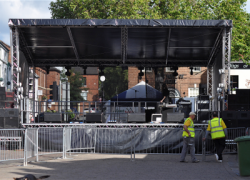 This Milos truss constructed stage covers a maximum area of 48 sq m ( 8m wide and 6m deep )and is ideal for small events. The stage is quickly is erected and an attractive center piece to any small event. The roof is constructed of black fire retardant pvc which is also waterproof. The sides are made of black scrim to allow for greater wind loading. PA wings ,steps and ramps are all available for this stage. For further assistance please contact one of the team .